Chocolate is a serious weakness of mine - I can never turn it down. So naturally I said yes to trying a chocolate making workshop! Chocolate Tales provides hands on classes and chocolate making parties that are as interesting as they are delicious. It opened my eyes to a whole new world of chocolate I never knew. 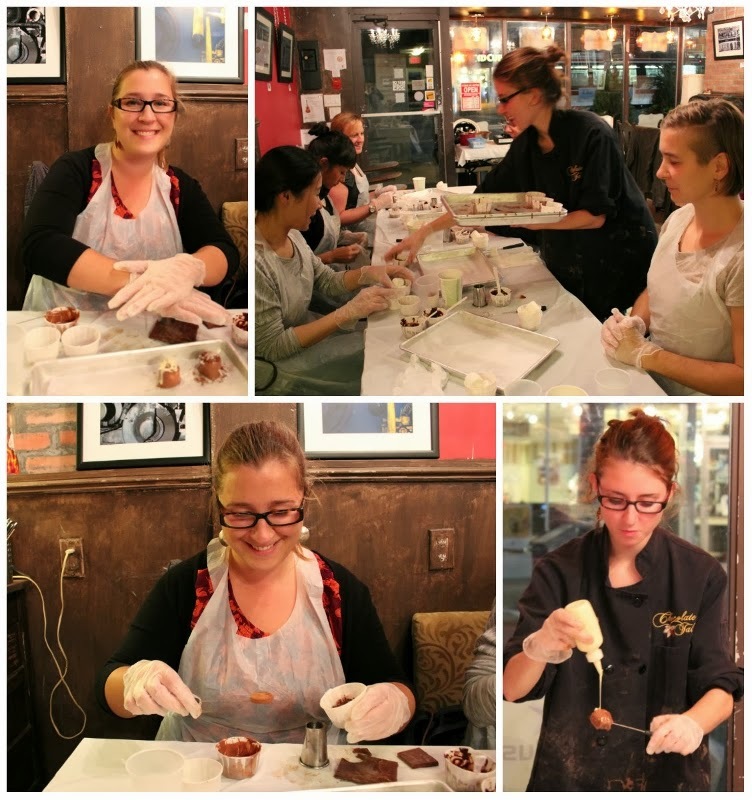 During the 90 minute Chocolate Making Class, we learned about the history of chocolate and got our hands dirty by creating our own truffles and bonbons. The best part is we were able to indulge in several samples and take home plenty of chocolate! 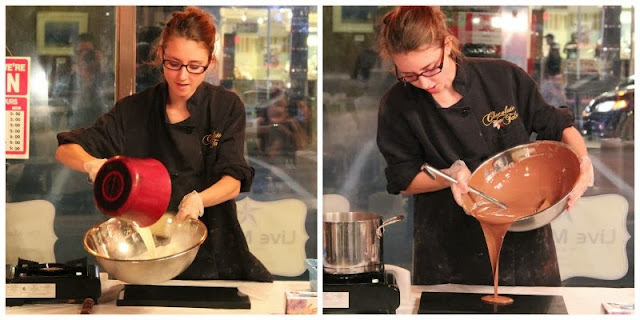 Our Event Host and Chocolatier, Cocoa Janel, began the class by delving into the origins of chocolate, all while teasing us by mixing and pouring a delicious, gleaming stream of velvety liquid Belgian chocolate ganache. Chocolate dates back thousands of years, with roots in Mexico, Latin America and Spain. Spaniards were the first to combine sugar with chocolate (halleluiah!). During our fun-filled lesson, she sprinkled in some chocolate facts and stories with humour. While learning about the origins of chocolate, we were schooled in the art and science of chocolate making. My favourite part of the evening involved sampling liquid chocolate mixed with spices like cinnamon, chili and ginger. Dreamy! After having our fill of samples, it was time to try our hands at making and decorating our own chocolates and enrobing marshmallows in chocolate. Each of us had a separate working station complete with utensils, aprons and delicious ingredients! 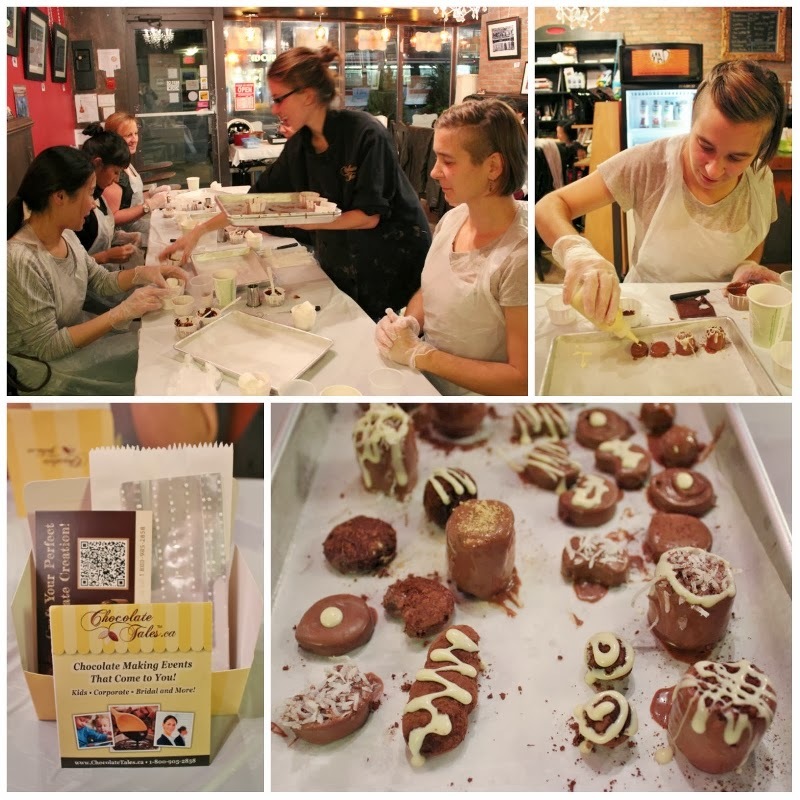 We were encouraged to unleash our inner Chocolatier and get creative; molding our chocolates, then drizzling them with white chocolate, coating them in cocoa powder, coconut and an assortment of spices. We were each able to make several of our own chocolates. Clearly I have some work to do on refining my chocolate decorating skills! At the end of the class we were given cute cellophane baggies and boxes to nicely package our sweet creations to take home. 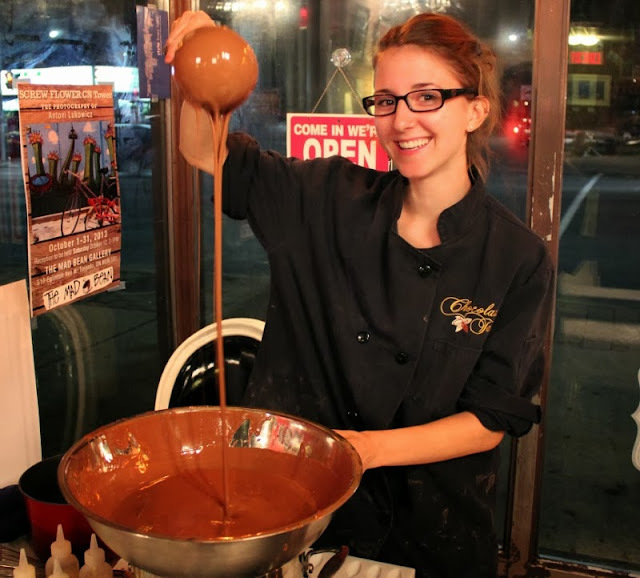 Chocolate Tales offers several workshops throughout Toronto including truffle making, tempering and a chocolate making program for kids. 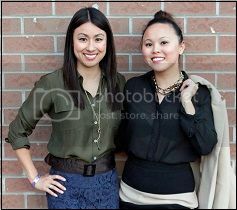 In addition to classes they also host theme, corporate and home parties. Natalia Dziubaniwsky is a professional in the not-for-profit sector, freelance writer and an avid traveller forever searching for a new adventure. A lover of life, wildlife enthusiast, movie buff and hobbyaholic, you can interact with her on Twitter @taliasfootsteps or follow her footsteps through her blog. I did a workshop today ... it was fun!